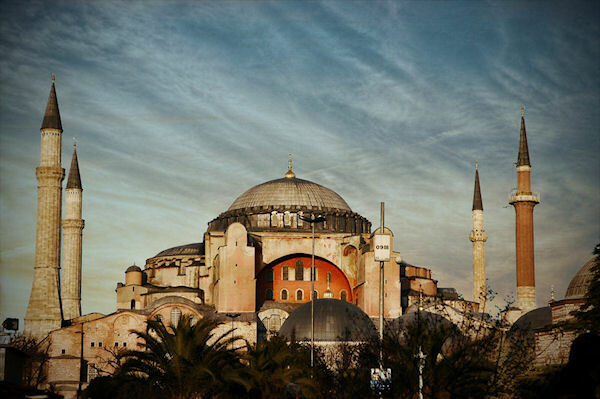 On day 1, you will be arriving in one of the most important and beautiful cities of the world’s history: Constantinople! Meeting your private lecturer/guide at the airport, you will be boarding your luxury minivan, and start your expedition in this fascinating city where the continents meet each other! Founded in 13th century BC, Greeks, Romans, and the Ottoman Turks left their traces of culture and architecture in Istanbul. Driving into the Old City you will be welcomed by the impressive view of the Roman Walls of Emperor Theodosius and will carry on to your hotel for check in and relaxation. Overnight in Istanbul. In the morning on day 2, you will be meeting your lecturer/guide at the lobby of your hotel and will start at 9:00 am your day of exploration of history and architecture. Your first visit will be to the Blue Mosque. Istanbul boasts its monumental shrines of different faiths and Blue Mosque is probably one of the most famed masterpieces of Ottoman religious architecture. Continue your morning by visiting the home of the Ottoman sultans: Topkapi Palace! Today you will be having an intense tour of the palace going through corridors and different sections of the Harem where Sultan lived with his family members. Leaving the Harem through the “Golden Corridor” you will reach the inner courtyard to visit the Treasury that displays exclusive examples of jewelry and accessories which were dressed by the Sultans or were given as gifts to ambassadors. Leaving the Topkapi Palace, you will you will be visiting the Basilica of Saint Sophia that was built by Justinian the Great during 6th century. Later in the afternoon, you will be exploring Grand Bazaar and Nuru Osmaniye District. Istanbul has been center of commerce and trade between the Orient and the Occident even before the arrival of Ottomans. After enjoying the experience of the Grand Bazaar, checking the exciting variety of handcrafted souvenirs, you will be transferred to your hotel. Overnight in Istanbul. After breakfast on day 3, you'll meet your lecturer/guide at the lobby of your hotel to start another day of 9:00am exploration in Istanbul. You will start your morning by discovering the church of St. Saviour in Chora and will be thrilled by the beauty of its gold gilded mosaics of 13th century. You will continue your morning touring with the Rustem Pasha Mosque dating back to 16th century. In the neighborhood where Rustem Pasha Mosque is located there will lead you through. Continue your day with a visit to Galata district that hosted European communities who migrated to Istanbul during 18th and 19th centuries to profit from out of the trade capitulations granted by the Ottoman Empire. Taking the elevator you will go up to the peak of Galata Tower that was built by the Genoese merchants during 13th century to view and direct their commercial ships arriving with their loads of goods brought for the markets of this timeless city. After exploring the architectural treasures of Istanbul, you will be escorted by your tour guide to the pier for embarkation to your cruise ship. Overnight aboard. Don’t forget your camera. Please note the rate is based on double occupancy – please contact us if you need a single rate. Please note breakfast is included in the cost of the tour, all additional meals are not included. This excursion is intended for a minimum of 2 passengers.